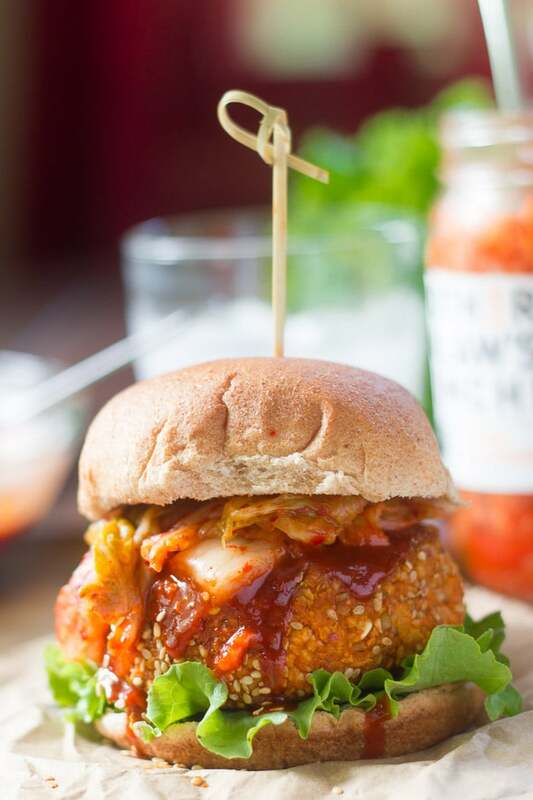 These tofu burgers are coated in sesame seeds, grilled to perfection, and topped with spicy Korean barbecue sauce and a dollop of kimchi. I’m usually walking around looking for excuses to eat kimchi. I mean, I know I could just grab a fork and eat it out of the jar and all, but it’s way more fun to do cool stuff with it! So, tofu burgers! Why haven’t I put kimchi on a burger until now? Probably because it wasn’t until recently that I got inspired to make the perfect burger vehicle for kimchi. I made these noodles a couple months back, and they were knock-your-socks-off good! But, more important that the noodles, were the meatballs. Equally knock-your-socks-off good. I think maybe it was the sauce covering both the noodles and the meatballs that created the perfect storm of spicy deliciousness. The meatballs were made of tofu, which, as I already knew, is a great main ingredient for vegan meatballs. But I think it worked particularly well with spicy Korean flavors, so I went and made a burger using the same basic formula as the meatballs. 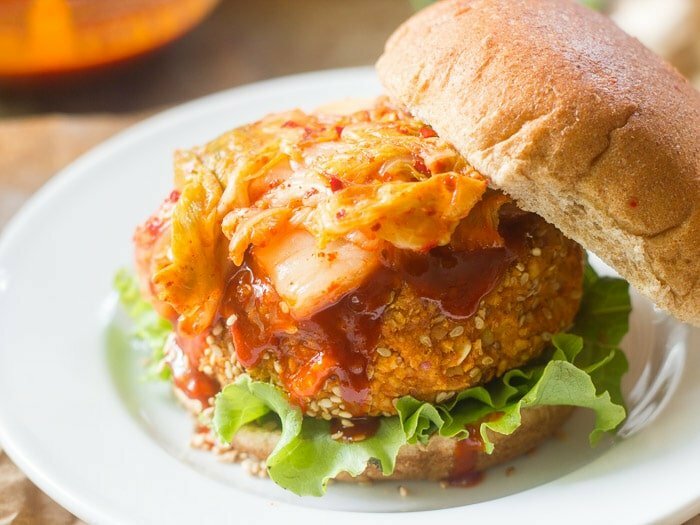 This worked out great because I could also cover the burger with spicy gochujang sauce, but also because kimchi makes a great burger topping. Double score! Last time I posted a kimchi recipe I got a bunch of questions and comments about whether or not kimchi is vegan. Read the ingredients! Some brands are vegan, some contain fishy stuff. I’m finding vegan kimchi pretty easy to find as of late, so hopefully it won’t be too tough for you. For this batch of burgers I used Mother In Law’s brand, which makes a vegan blend. The jar actually says “vegan” on it, so that makes me happy. It’s also nice and spicy. Make the Korean barbecue sauce first by stirring all ingredients together in a small bowl. Set aside. To make the burgers, first place the oats into the bowl of a food processor fitted with an S-blade. Blend to until very finely ground. Break the tofu into a few chunks and add it to the bowl, along with the walnuts, onion, garlic, gochujang, maple syrup, soy sauce, and sesame oil. Pulse until all ingredients are finely chopped and well incorporated. Shape the mixture into 4 patties. Place the sesame seeds onto a plate. Coat the bottom of a medium skillet with oil and place it over medium heat. 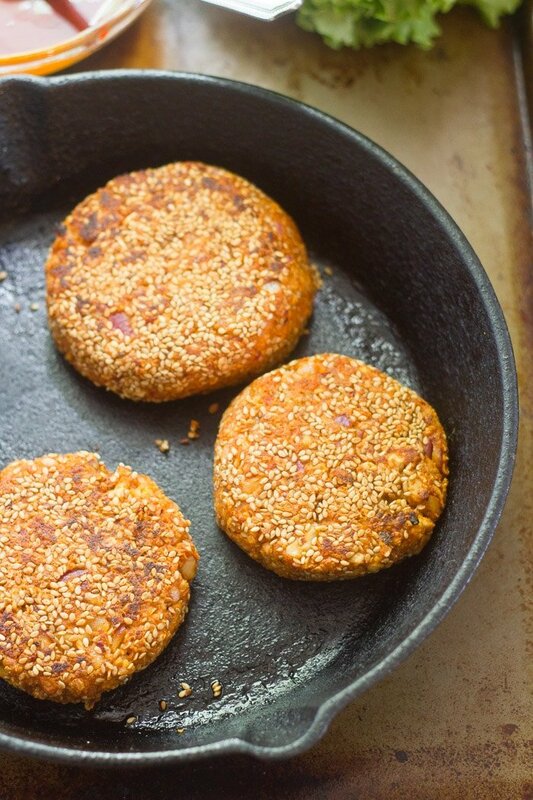 When the oil is hot, grab a patty and roll it gently in the sesame seeds to coat, then transfer it to the skillet. Repeat for as many burgers as will fit into the skillet. Cook for about 6-7 minutes on each side, until lightly browned. Repeat until all of the patties are cooked, adding oil to the skillet as needed between batches. Slather the buns with vegan mayo and stuff them with the patties. 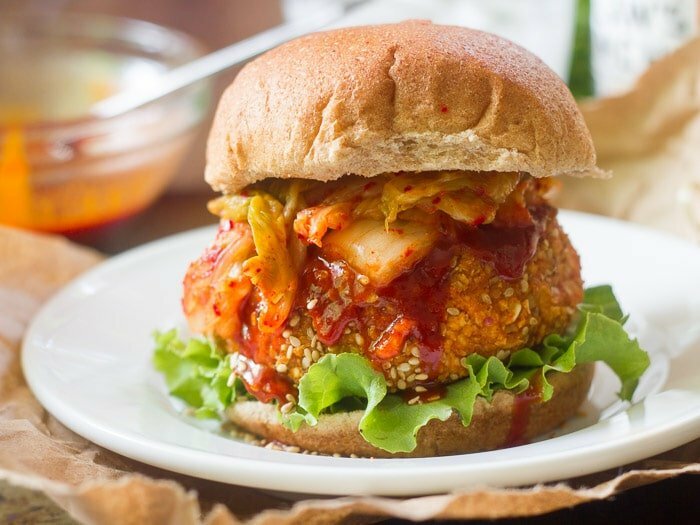 Top with Korean barbecue sauce, kimchi, lettuce, and any other toppings you like. Serve. These are awesome and I love them. Going to enter my regular meal rotation for sure. Yay! I’m glad you enjoyed them!! omg, they’re so tasty! I just did this recipe for the first time and I’m just fighting with myself to not to eat them all at once. thanks for it, and I must say that that’s not the only one recipe of yours that I’ve tried and loved. Yay!! I’m so glad you enjoyed them! Thanks so much Karina! Made garlic mayo as well and it’s soo good with the kimchi on top, perfect! Yay! I’m so glad you enjoyed them! Thanks Bella!